Utilize the same interface as Microsoft Office applications, with the most commonly used commands and features readily accessible from a ribbon bar atop the screen. Scanner operators can keep their eyes on their work and easily invoke numerous Kofax Express features with a single click of the mouse. Manipulate multiple document images with ease via innovative SmoothView™ technology. Find, replace, gather, zoom, divide, rotate, swap, order and place document images in ways you never could imagine with a stack of paper. Integrated Kofax VRS technology ensures images will look better than their paper originals without any pre-scan document preparation. Automatically extract index field data from documents. Users can train Kofax Express to locate the key index information in a document and automatically remember that location and extract the data from future documents. Easily index documents by selecting the text in the document with a computer mouse. 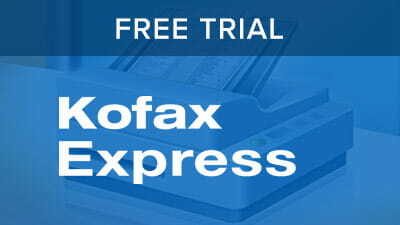 Kofax Express automatically populates the index field with the information highlighted by the user, saving keystrokes and making the indexing of documents faster and easier. Index, classify and deliver documents and data into Microsoft SharePoint for easy and fast retrieval. Kofax Express also supports direct integration with Kofax Capture and provides an export API for custom or advanced export use cases.